Hari Prasanna has been in the networking industry for more than 7+ years, with a focus on Cisco networking for the past three years. Hari holds CCIE (#29790), CCSI (#33320), JNCIA, CCSA, CCNA, CCNP certifications under his belt and is currently one of the elite members produced more than 200+ CCIE's within short span of time. Hari has experience in the IT field providing Network Consulting and training for students from more than 20 countries around the globe. With a wealth of certifications, Hari's proven abilities as an engineer and dynamic instructor place him among the best worldwide. A Cisco Certified instructor, Hari has created world class curriculums that have enabled students to successfully master and clear the CCIE exams. 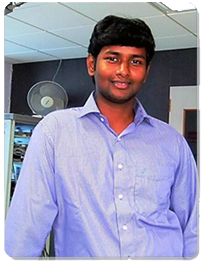 A graduate of Computer Science from the Sona Institute of Technology, Anna University, Hari brings in a wealth of experience and expertise to P2G tecch and has personally devised the training methodology and curriculum. He has been delivering CCIE level training for the past eleven years. Hari possesses not only the technical competency, but also the leadership and visionary talent needed to thrive in a targeted niche training market. Hari founded P2G tecch in 2011 and the company continues to revolutionize the way engineers prepare for the prestigious CCIE Lab certification. Hari is highly experienced in spotting students strengths and weaknesses in the areas tested in the Lab Exam. Hari taught and developed CCIE preparation courses for various well known training organizations. Hari brings his years of teaching experience to the classroom, but also real world enterprise and service provider experience. With an eye for revolutionary products, services and solutions, he has moulded P2G tecch into the clear leader in CCIE Lab & Networking training along with exposure to multi-vendor products in security aspect. Having started the company alone, Hari has selectively chosen professionals to join the company, positioning it to run autonomously.